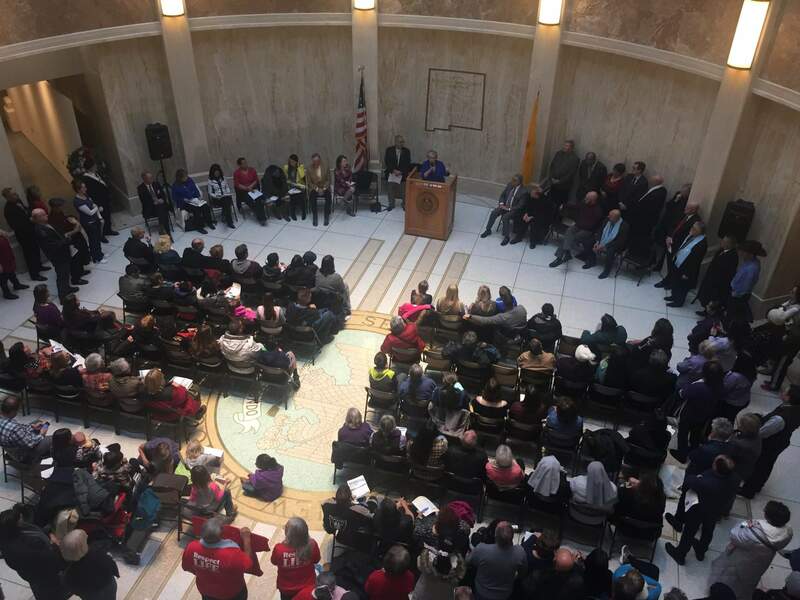 Opponents of proposals to legalize medically assisted suicide for terminally ill patients and eliminate the state’s dormant ban on abortion procedures attend a rally in the New Mexico Statehouse in Santa Fe on Jan. 16. It’s the first test of an assisted suicide bill since the election last year of a Democratic governor and a larger Democratic House majority. Current law that withstood a Supreme Court challenge in 2016 makes it a felony for a physician to assist a patient in ending his or her life. Gov. Michelle Lujan Grisham campaigned on reforming the state’s prohibition on medically assisted suicide and supports the newly filed legislation from Armstrong and Stefanics, said Nora Sackett, a spokeswoman for the governor’s office. The legislation would create the “Elizabeth Whitefield End of Life Options Act,” named for a former state district judge who testified in favor of a bill to legalize physician-assisted suicide in 2017. That bill was defeated by a 22-20 vote of the state Senate. Whitefield died of cancer in August 2018.